New book, 256 pages, 145 black and white pictures, 30 colour pictures, 3 maps and 17 colour drawings. The June 1967 War fought between an Arab alliance and Israel was a pivotal event in the modern history of the Middle East. 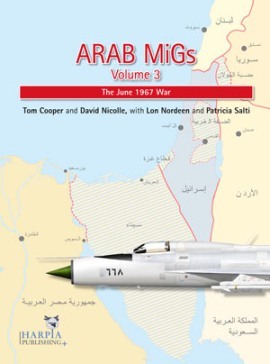 This study provides the most complete and detailed coverage ever of the Arab air forces during the course of that conflict. Supported by original documentation, and hundreds of blow-by-blow accounts from participants and eyewitnesses from Egypt, Iraq, Jordan and Syria, the result is a fascinating and gripping narrative that uncovers many new stories for the first time.